The antibody recognizes an epitope containing (serine/threonine) O-Linked N-Acetylglucosamine, which is found on hundreds of nuclear and cytoplasmic proteins, including “FG” nucleoporins of the nuclear pore complex. The sugar is a key part of the epitope. The antibody detects nuclear pore complex (NPC), cytoplasmic and intranuclear O-Linked glycoproteins from human, mouse, and rat tissues. In Western blot, many bands are expected as the O-Linked N-Acetylglucosamine modification can occur on proteins of different sizes. ICC-IF: MCF7 cells. WB: Jurkat cells treated with 50 uM PugNAc; SH-SY5Y) whole cell lysate - treated with 50µM z-Pugnac; Rat Liver Nuclear Envelope lysate. 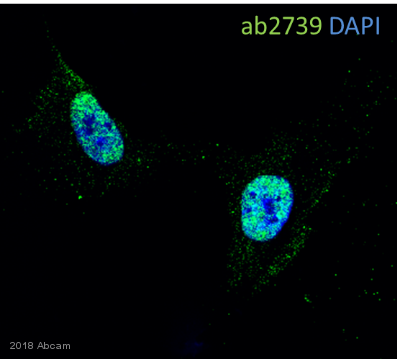 This antibody clone [RL2] is manufactured by Abcam. Our Abpromise guarantee covers the use of ab2739 in the following tested applications. Many cellular proteins, including nuclear pore, oncogene, cytoskeletal, heat shock, viral and transcription regulatory proteins contain single O-linked N-acetylglucosamine (O-GlcNAc) residues attached to serine or threonine residues. 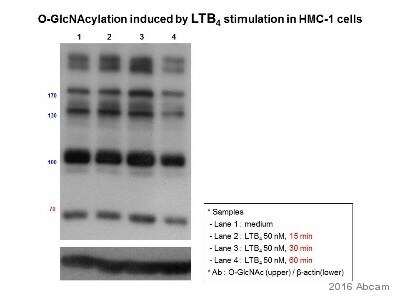 It has been observed that O-GlcNAc glycosylated proteins tend to be under phosphorylated relative to unglycosylated proteins and that O-GlcNAc bearing proteins tend to be found in multimeric complexes. This has led to the suggestion that O-GlcNAc glycosylation may obscure phosphorylation sites and acts as a signaling mechanism or mediator of signaling. ab2739 stained in MCF7 cells. 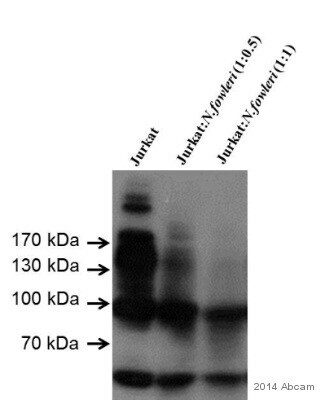 Cells were fixed with 4% paraformaldehyde (10min) at room temperature and incubated with PBS containing 10% goat serum, 0.3 M glycine, 1% BSA and 0.1% triton for 1h at room temperature to permeabilise the cells and block non-specific protein-protein interactions. 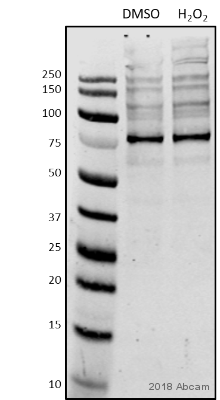 The cells were then incubated with the antibody ab2739 at 5µg/ml and ab6046 (Rabbit polyclonal to beta Tubulin - Loading Control) at 1/1000 dilution overnight at +4°C. The secondary antibodies were ab150080 (pseudo-colored red) and ab150117 (colored green) used at 1 ug/ml for 1hour at room temperature. DAPI was used to stain the cell nuclei (colored blue) at a concentration of 1.43µM for 1hour at room temperature. Jurkat cells were treated with either 50 uM PugNAc (ab144670) or 4 mM glucosamine + 50 uM PugNAc (ab144670) for three hours prior to harvest to stimulate O-linked glycosylation. The expected increase in glycosylation is observed in the treated lanes 2 & 4. Immunohistochemistry (Frozen sections) - Anti-O-Linked N-Acetylglucosamine antibody [RL2] (ab2739)Image from Gurel, Zafer et al., Molecular vision vol., 19, 1047-59. Fig 4.; Mol Vis. 2013 May 21;19:1047-59. Print 2013. O-GlcNAcylated proteins localize to retinal vascular plexus. A: Eye sections from P10 and 7-month-old Ins2Akita/+ mice. 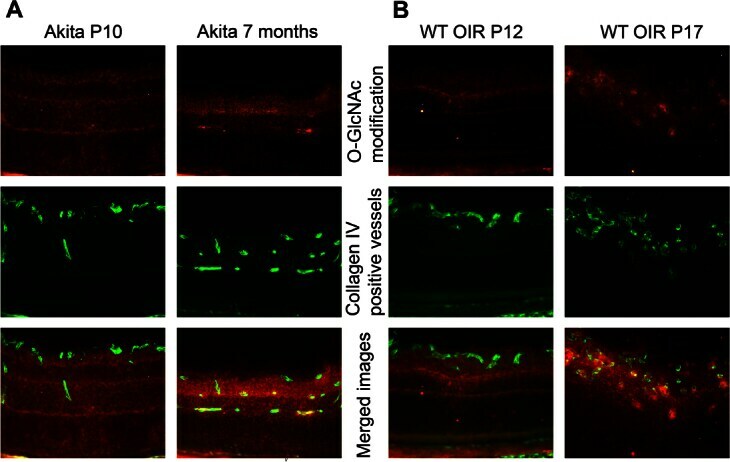 B: P12 and P17 oxygen-induced ischemic retinopathy (OIR) wild-type (WT) mice. O-GlcNAcylated proteins labeled with Cy3 (red, first row), vascular plexus labeled with Cy2 (green, second row) and merge images (third row). Please note the high amount of O-GlcNAcylated protein colocalization with the retinal vascular plexus in 7-month-old Ins2Akita/+ and P17 OIR eyes (arrowheads). These images are representative of images evaluated in eyes from at least six mice (original magnification x200). Zafer et al., Molecular vision vol., 19, 1047-59. Fig 4.; Mol Vis. 2013 May 21;19:1047-59. Print 2013. The antibody was tested against the immunogen (isolated rat liver nuclear envelopes, which contain 8 O-linked glycoproteins in the nuclear pore complex). Thank you for the reply and the recommendations. I have one question though. We are not looking for an antibody to detect the enzyme B3GNT6. We are looking to detect core 3 0-glycan(this glycosylation is done by B3GNT6). If I am understanding your email correctly are you telling that AB2735 detects core 3 0-glycan? In the uniprot link it says it is a core3 synthase. Isn't that the enzyme B3GNT6? You are correct that the uniprot link in the previous email (Uniprot: http://www.uniprot.org/uniprot/Q6ZMB0http://www.uniprot.org/uniprot/Q6ZMB0) is for the core 3 synthase, which is B3GNT6. Inferring from the alternative names for this synthase (Beta-1,3-N-acetylglucosaminyltransferase 6) is how the relation to ab2735 was established, since ab2735 recognizes beta-1,3 linked O-linked N-acetylglucosamine (O-GlcNAc). 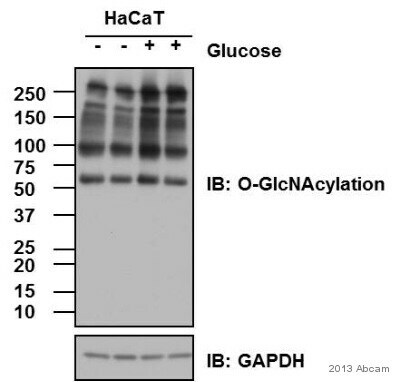 However, this information does not guarantee that an anti O-GlcNAc antibody such as ab2735 will be specific for core 3 O-glycan, as core 2 and core 4 are also formed by the addition of N-acetyl-glucosamine. We are trying to get an antibody against core 3 structure of o- glycans. I checked abcam site and found a few antibodies against the enzyme B3GNT6 which synthesizes the core 3 structure. Could you tell me if abcam carries any antibody against the glycosylated core 3 structure? It has to be specific against core 3 structure. 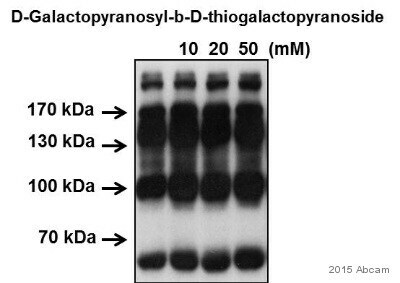 Also could you check if the antibody against the B3GNT6 enzyme detect core 3 O glycan? I can confirm that the B3GNT6 antibodies, https://www.abcam.com/b3gnt6-antibody-ab103239.html& https://www.abcam.com/b3gnt6-antibody-ab168600.html, will recognize the transferase that synthesizes the core 3 structure of the O-glycan. We also currently offer 2 antibodies, https://www.abcam.com/O-Linked-N-Acetylglucosamine-antibody-HGAC85-ab2735.html and https://www.abcam.com/o-linked-n-acetylglucosamine-antibody-rl2-chip-grade-ab2739.html, against Anti-O-Linked N-Acetylglucosamine. https://www.abcam.com/O-Linked-N-Acetylglucosamine-antibody-HGAC85-ab2735.html shows specificity for the Core 3 synthase (Uniprot: http://www.uniprot.org/uniprot/Q6ZMB0http://www.uniprot.org/uniprot/Q6ZMB0).